Project 2: Climate forcing of harmful algal blooms and toxicity exposure in the Northeast U.S.
Our goal is to understand and predict how climate variability influences harmful algal bloom (HAB) dynamics, toxin exposure to the human population, and impacts on human health. We hypothesize that climate-induced environmental changes will influence the composition, distribution, and severity of HABs in ways that are predictable based on response to previous climate forcing. Our studies will focus on the dinoflagellate Alexandrium fundyense and diatoms of the genus Pseudo-nitzschia, organisms that produce saxitoxin and domoic acid, respectively. Using the Gulf of Maine (GOM) and Nauset Marsh (NM) as model systems, we will construct hindcast simulations from 1900 through the present. These hindcasts will be based on state-of-the-art climate models from the Coupled Model Intercomparison Project Phase 5 (CMIP5), into which existing models of A. fundyense and a to-be-developed model of Pseudo-nitzschia spp. will be incorporated. Hindcasts will be evaluated on the basis of climate data records assembled herein, documenting fluctuations in abundance of the target species as well as toxicity (toxin accumulation) in coastal shellfish resources. A submodel will be developed to estimate human exposure to these toxins. Discrepancies between the hindcasts and observations will guide iterative model improvement. Once satisfactory agreement has been achieved, the models will be run in forecast mode with various climate change scenarios. 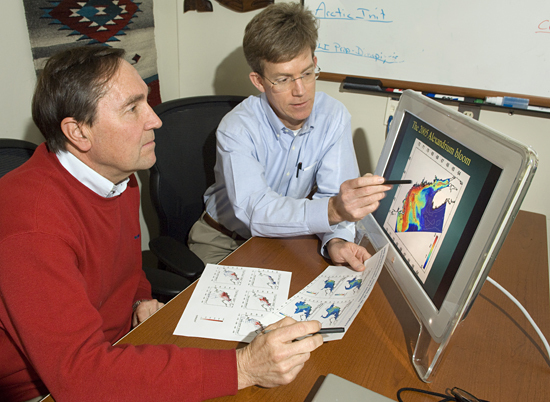 The proposed research will be integrated into the WHCOHH in several ways: (1) what is learned about bloom dynamics in Project 1 will be used to improve HAB models; (2) development of the exposure submodel will be undertaken in collaboration with Project 3; (3) all three projects will participate in the analysis of climate-forced variations in HABs and threats to human health; and (4) results will be communicated through the Community Engagement Core.